Biodiesel is a biofuel that is produced from animal fat, vegetable oils, or recycled restaurant greases. This biodegradable liquid fuel is composed of fatty acid alkyl esters, fatty acid methyl esters, or long-chain mono alkyl esters. Bioblends are mixtures of biodiesel and petroleum-based diesel. Biodiesel is considered to be a good petroleum-based diesel replacement for use with compression-ignition engines because it emits less harmful gases and sulfur when burned. Biodiesel is also considerably safer than its fossil-based counterpart since it is non-toxic and less combustible (higher flash point). Although biodiesel contains about 8% less energy per gallon than petroleum diesel, no significant difference in performance or fuel economy has been reported. The U.S. Department of Energy says there is enough supply of virgin soy oil, recycled restaurant grease, and other feedstocks to produce about 1.7 billion gallons of biodiesel per year under policies designed to encourage biodiesel use in the country. Biodiesel is produced through esterification. Fats and oils are mixed with an alcohol, usually methanol, to form fatty acid methyl esters in the presence of a catalyst, usually sodium hydroxide. Glycerin is a by-product of biodiesel production. 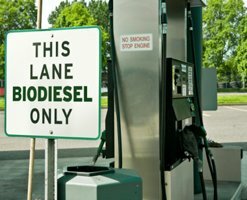 In the U.S., it is legal to blend biodiesel with petroleum-based diesel in any percentage. B100 biodiesel is pure biodiesel, B20 contains 20% biodiesel and 80% petroleum diesel, and B5 contains 5% biodiesel and 95% petroleum diesel. Most of the biodiesel users choose B20 because it does not have the same cold-weather performance and material compatibility issues that B100 has. Bioblends also emit less greenhouse gases when combusted compared to petroleum diesel. According to the U.S. Department of Energy-Alternative Fuels & Advanced Vehicles Data Center, using B100 reduces CO2 emissions by more than 75% compared with petroleum diesel. Using B20 reduces carbon dioxide emissions by 15%. There are many incentives and laws for the use of biodiesel and bioblends at state and federal levels. The state of Washington has the most with 4 incentive programs and 13 laws. Most states offer tax exemptions and deductions to encourage people to use biodiesel. B100 and blends of B20 or higher qualify for alternative fuel credits under the Energy Policy Act of 1992.